A grass farm on the West Rand turned into an autumn wonderland recently with a massive silver cloak, thought to have been woven by tiny spiders, stretching over the fields. ''I have never seen anything like it before,'' said plane enthusiast Brendan Evans, who quickly captured the fairytale scene between the Krugersdorp Game Reserve and the Jack Taylor Airfield in Delporton, outside Krugersdorp. But, the ethereal display at the beginning of May was brief, as the lawn is regularly mowed, sprayed and watered before it is rolled up and sold. You had to be there at the just right time to see the spectacle. It is also not to be confused with another photograph doing the rounds of a thick silk spider blanket in Australia. When News24 went to have a look at the Delporton net, only one or two of the tiny brown arachnids could be seen, their webs carefully concealed and close to the ground. They darted off quickly during capture attempts and camouflaged themselves easily among the grass roots and wet soil. The surrounding area is a mixture of peaceful farmland, light industrial, and the amber and limestone grassy koppies of western Gauteng. Without a spider sample to examine, spider expert Astri Leroy studied the pictures and speculated that it could have been the work of a large population of spiders. She has seen spider cloaks before in the Nylsvlei Nature Reserve, a flood plain in the Waterberg. She thinks the waste treatment plant near the Krugersdorp ''blanket'', which has the human nose twitching from the smell, could attract an enormous amount of insects to the area. ''Of course, spiders cotton on to this, they are not dof,'' said Leroy, author of the book Spiders of Africa and a member of the Spider Club of SA. The ready supply of small insects would mean a never-ending gala dinner for the industrious arachnids. Both Leroy and arachnologist Norman Larsen think the spiders may have travelled using their own built-in transport system known as ''ballooning''. ''Ballooning is one of the methods of spider dispersal,'' explained Larson, who revised the late Martin Filmer's book Filmer's Spiders: An Identification Guide for Southern Africa. ''The spiderling will tip its abdomen up into the air and release silk from its spinnerets. When the spider and silk becomes lighter than air, in slow moving air, it will float/balloon away to a new location,'' he told News24. 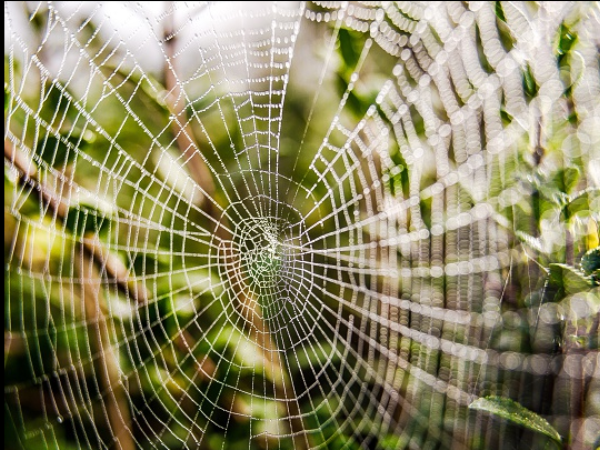 In the book he writes that the ''sheet webs'' provide particular spiders with a retreat or living area, with the top being a nice smooth running space to catch their prey. The tensile strength of spider silk ''exceeds that of high-grade steel'' so it would withstand a quick dash for a tasty morsel. Or, strands of silk could get dropped down, and if an ant bumps into it, it will get stuck and be pulled towards the spider. Some observers have suggested that the ''blankets'' could also be spiders' way of protecting themselves on flood plains by building the canopy above the ground. Or, they could have attached themselves to a plane wing and hitched a ride as far as Krugersdorp. But in the meantime, it appears as if the spiderlings have taken to the air again, and drifted off to even greener pastures.